EIL Recruitment 2019 - Job notification for Medical Consultant Posts in EIL, New Delhi, Gurugram. Applications are invited by Engineers India Limited (EIL) on or before 22 Apr 2019 for 3 vacancies. EI Bhawan, Bhikaiji Cama Place, New Delhi or EIL Complex, Sector 16, Gurgaon. Eligible candidates Doctors, may e-mail their detailed profile in the enclosed format to anupam.borah@eil.co.in with the subject caption “Medical Consultant” and send hard copy along with copies of relevant documents to GM (Recruitment & Manpower Planning), EIB-6th Floor, Engineers India Ltd., 1, Bhikaiji Cama Place, New Delhi-110066 on or before 22 Apr 2019. EIL Recruitment 2019 - Apply Online for Apply Online/ Offline for Director (HR) Post in Department of Personnel & Training, EIL, New Delhi on Absorption. 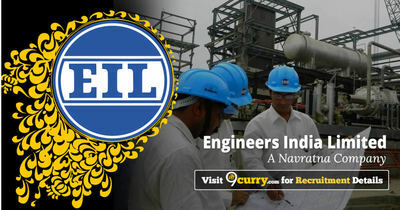 Online Applications are invited by Engineers India Limited (EIL) from 10 Apr 2019 to 17 June 2019 till 03:00 PM for 1 vacancy.